The Colonel never did anything for me growing up – to this day, I am wedded to the addictive blend of herbs and spices that form a layer of lipsmacking goodness around the crisp skinned chickens roasted at the Peruvian joints in Northern Virginia (or for us OGs, two up – two down*) And I’m lying when I say joints, for there is only one location that has my heart, and that’s El Pollo Rico. The exterior of the restaurant looks like a nondescript warehouse with bumping fluorescent lighting and a steady clip of customers zipping in and emerging with styrofoam containers and brown paper bags almost translucent from the french fry grease. Like a speakeasy for chicken, my dad would always run in, broker the deal and grab the bounty, returning with parcels that perfumed the car with the scent of cumin, garlic and majesty. When we finally got home and tucked into the feast, it was scandalously good – the chicken was served with fat steak fries, and both items would receive a ceremonial dip in a mustard/mayo sauce and then a dollop of fresh minced jalapenos before making it to my greedy mouth. 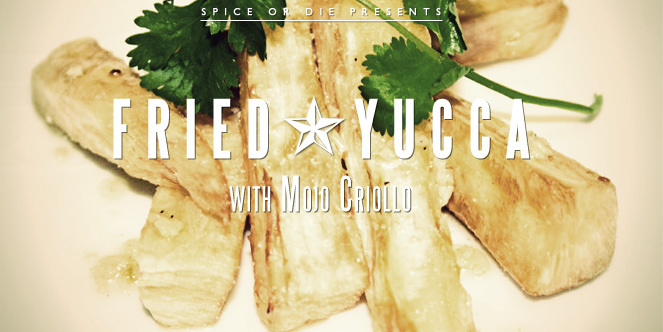 And if I was lucky (really lucky), they’d still have fried yucca in stock, which we’d bring home in lieu of the fries. Cracklingly golden on the outside and tender in the center, this was the first preparation I’d ever had for yucca and I was sold for life. In fact, I loved it so much that I had to find a way to prepare it at home – I couldn’t wait for trips to the right coast to get my yucca fix. For all of you yucca virgins out there (which I realize is off-color given the shape and size of the thing, lol), this tuber can be a little cumbersome the first time that you work with it. The waxy, brown outer skin is tough, and the inner flesh fibrous and difficult to cut. Break out your sharpest peeler and butcher knife and be careful as you cut. Bloody yucca is so not cool. Once you make the yucca do your bidding, you’ll want to boil it briefly before frying – this ensures a tender interior and a crisp outside. I serve these babies with a sauce traditionally made of garlic and sour orange juice called mojo criollo – since sour oranges can be hard to find, here I use plain old orange juice and lime juice to get the job done. Begin by making the mojo – add the olive oil to a skillet and heat on high. Add the garlic and cook until fragrant but not browned, about 30 seconds. Add the orange juice, lime juice and cumin and bring to a boil. Taste for salt and pepper and season. Set aside and allow to come to room temperature. Bring a large pot of water to a boil. While the water warms up, peel the outer skin of the yucca. Cut into wedges 3 inches long and 1 inch wide, like steak fries. Add to the boiling water and cook for five minutes. Pour in 1 cup of cold water and cook another five minutes. Drain the yucca from the water and dry with paper towels. Heat a wok or deep fat fryer filled with oil to 350°. Add the yucca and fry until golden brown, about 3-4 minutes. Drain on paper towels and season with salt while still hot. Serve with the mojo on top or on the side for dipping.